This toolkit was created to help magnet schools and their partners across the United States to engage with state and local decision makers around the implementation of the Every Student Succeeds Act (ESSA). States are required to engage with stakeholders as they write their new state plans. While Magnet Schools of America (MSA) prioritizes certain sections of the law (and therefore provides relevant resources), MSA encourages schools to be involved as much as possible in the work happening in their states around the new law. This is a historic moment for K-12 education, with more control being given to the local education agencies. The more magnet schools engage, the more our voice will be heard and hopefully our priorities addressed. The Every Student Succeeds Act reauthorizes the Elementary and Secondary Education Act, also known as No Child Left Behind, and is the federal law for K-12 public education. ESSA was signed into law in 2015 and will take full effect in the 2017-2018 school year. The law was designed to increase opportunities for local input and flexible decision making based on what communities and states need to provide a quality education to their students. The new law can also be viewed as a civil rights law – it seeks to ensure every child, regardless of race, family income, background or zipcode, has the opportunity to succeed. Therefore, this is an opportunity to prioritize racial and socioeconomic integration. Importantly ESSA includes the requirement that state and local education agencies engage in “timely and meaningful consultation” with a variety of stakeholders while developing Title I and accountability plans. Different sections of the law are already being implemented and the U.S. Department of Education’s Office of State Support has launched a State Support Network, to help states and districts to develop strategies to support school improvement and improve student outcomes. How can magnet schools get involved in implementation of ESSA? Ask your state board of education to include progress toward racial and socioeconomic integration in its statewide accountability system. Students in integrated schools have higher average test scores. Students in integrated schools are more likely to enroll in college. Integrated schools help to reduce racial achievement gaps. Integrated classrooms encourage critical thinking, problem solving, and creativity. Because magnet schools break down traditional school attendance boundaries by allowing families to choose schools that appeal most to their children’s academic interest and talents, they are often more integrated. There is also strong evidence that students who attend magnet schools have the ability to adopt multiple perspectives, a diminished likelihood for acceptance of stereotypes and develop more cross-racial friendships. Since schools already collect information on the race and ethnicity of students, and have access to socioeconomic data through the National School Lunch Program, Temporary Assistance for Needy Families and other sources, reporting on the year-over-year changes in these numbers would require minimum effort. States can use these metrics and trends to reward schools and districts for being more diverse and improving regional equity through a special designation or waiver from other aspects of the accountability system. As state education leaders think through the development of their “non-academic” or “fifth indicator” for their accountability system, they will want research. Share the research on the benefits of school integration and the research on the academic and social benefits of attending magnet schools. Point to New York City as an example of city adopting a reporting system on socioeconomic integration and how the district used the data to make a plan to address problems. Last year, NYC adopted legislation requiring the Department of Education to issue an annual report on diversity. The report includes school-by-school data, down to the grade level, as well as the Department’s specific efforts and initiatives to strengthen diversity. Encourage state to adopt progress toward racial and socioeconomic integration as a fifth indicator. Ask state and local school districts/superintendents to consider the magnet school approach as an option for promoting student academic achievement in the lowest performing schools as part of a comprehensive Title I school improvement strategy. The U.S. Department of Education has already concluded that federal funds under the School Improvement Grants program can be used to promote diversity. As part of Duval County’s desegregation plan, magnet schools were established at approximately half of the district’s 150 schools. The researchers found that magnet school students’ Stanford Achievement Test scores exceeded those of non-magnet school students at the elementary, middle, and high school levels. In addition, the test scores received by low-income magnet students exceeded those of the district’s low-income non-magnet students. A study conducted by Houston Independent School District’s Department of Research and Accountability (2007) analyzed the performance of students enrolled in three different types of magnet programs at 105 of the district’s schools: school-within-a-school magnet programs, separate magnet schools, and add-on magnet programs. Results from the Texas Assessment of Knowledge and Skills and the Stanford Achievement Test indicated that students in all three types of magnet programs in all grades had higher passing rates on the reading, mathematics, writing, and science subtests of the assessments than did their respective grade-level counterparts districtwide. As part of the transition to ESSA, states must submit a detailed plan to the U.S. Department of Education explaining how it will implement the new law. ESSA further requires that states conduct “extensive outreach and community engagement” with education stakeholders and the general public during the development process of these state plans. This provides an opportunity for individuals and groups to play an integral role in developing state education policy. You can do this by participating in stakeholder meetings and listening sessions and weighing in on the draft Title I plan. 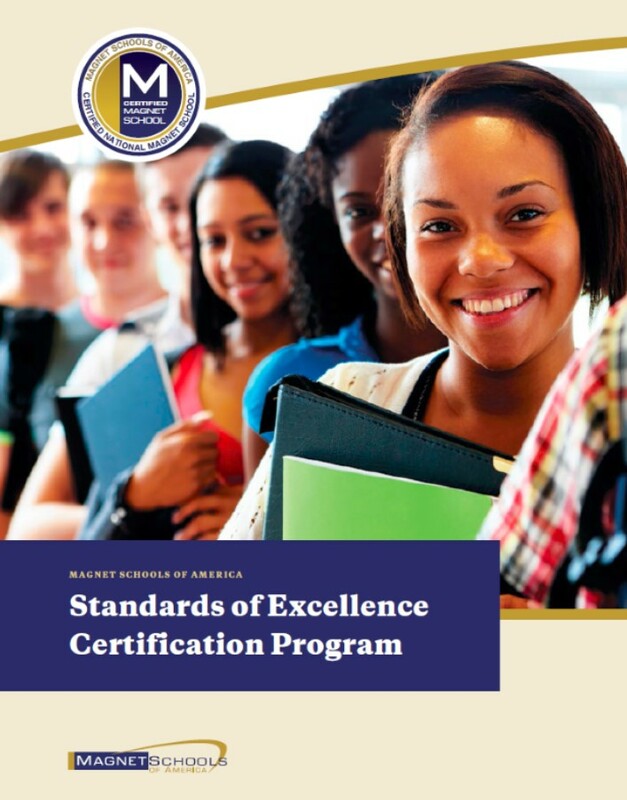 You can share Magnet Schools of America Standards of Excellence as a possible roadmap for a comprehensive improvement strategy. Encourage school districts to apply for MSAP federal funding and inform them that transportation costs are an allowable use of funds. You can work with your state education officials to understand their goals for K-12 improvement and leverage various funding streams available through ESSA to help them provide a well-rounded education to their students. Here is a letter from the U.S. Department of Education providing related guidance. Ask your state to use Title IV Part A funding, known as the Student Support and Academic Achievement State Grants, for theme-based programs in magnet schools, like STEM, arts and music, foreign languages, career & technical education, etc. The focus of Title IV, Part A of ESSA is to (1) provide all students with access to a well-rounded education, (2) improve school conditions for student learning, and (3) improve the use of educational technology in order to improve the academic achievement and digital literacy of all students. The underlying goal is to help provide students with a well-rounded education. The grant program is a formula grant program, meaning each state will receive a certain percentage. States would submit a plan describing how the state education agency will use funds for state level activities and award grants to local education agencies. Magnet schools stand to benefit from such grants. Share this guidance from the U.S. Department of Education with your state and local education agencies so they understand how the program works and how Title IV Part A can work with other funding streams such as the Magnet Schools Assistance Program (MSAP). The U.S. Department of Education will continue to issue guidance to the state and local education agencies around different aspects of the new law. There may also be opportunities for magnet schools to weigh in with US DOE on various rules – such as the recent supplement not supplant rule. Magnet Schools of America will continue to participate in these conversations at the federal level, but should federal level engagement interest you or if you have particular background or expertise which can help inform the implementation of the law, please visit the U.S. Department of Education’s website or contact our Legislative and Communications Manager. The National Coalition for School Diversity has produced an issue brief focused on prioritizing school integration in ESSA State Implementation Plans. The National PTA has organized the state departments of education ESSA webpages onto one landing page. Visit this page to connect with what is happening in your state. Get ESSA Right: Provides information from the National Education Association about ESSA implementation at the federal and state level. Also includes resources specifically for communities, a state map with contact information for each state’s Education Association, and general ESSA updates. National Association of Elementary School Principals has resources for principals ranging from links to its webinar series on selected ESSA topics to information on provisions in Titles I and II. National Association of Secondary School Principals has organized their comments and positions regarding ESSA rulemaking and webinars with summaries of ESSA provisions. Association for Supervision and Curriculum Development shares information about ESSA timelines, comparisons to NCLB, Title provisions, and a webinar series. American Federation of Teachers has ESSA FAQs, fact sheets for different teacher audiences, and transition timelines. American Association of School Administrators has resources about ESSA accountability, assessments, proposed regulations, community-school partnerships, foster and homeless students, and other topics. Council of Chief State School Officers compiles resources broken down by topic including stakeholder engagement, advocacy, federal funding streams, English learners, and more.